Back in 1987, I was blown away by Bill Bruford's first Earthworks group, Kazumi Watanabe's trio with Jeff Berlin and of course, David Torn's "Cloud about Mercury" band with Mark Isham and Tony Levin, featuring Bruford's post Patrick Moraz/King Crimson era Simmons SDS7 electronic drum kit. 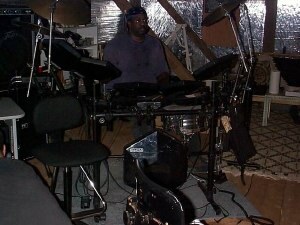 I was so enamored of this new technology and music, that I soon embarked on creating my own version. 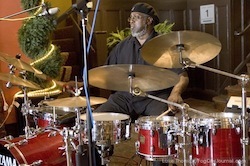 Thanks to a basic 5 piece, Simmons SDS 9 kit given to me by my good friend Stephen Bray, I was off and running. The addition of 5 more Simmons pads, (courtesy of my chums at Guitar Center), Roland's newest MIDI drum brain, the PM-16, the Roland TR-505 drum module, and a Yamaha TX-7 synth, I was able to duplicate many of the sounds and patterns played by Bruford on his Yamaha DX21, Simmons SDS 7 and MTM modules. The advent of the more affordable Roland, Yamaha, Akai and Alesis drum brains, soon led to the demise of the overpriced and unreliable Simmons. When Bruford debuted the new $10,000 SDX in 1990, it was already too late, despite its computer and sampling capabilities. The SDX would infamously fail Bruford at a Yes show at Madison Square Garden. Bruford was done, never to play electronic drums again and Simmons would never recover. Bruford went on to form an all acoustic version of Earthworks in 1999, however I had stayed true to the world of electronic percussion, creating the Drummstick and following the path of Futureman of Bela Fleck and the Flecktones. "The Beast", as Bruford once called the Simmons kit, would now sit idly by, as the more mobile Drummstick rig became my instruments of choice. Ultimately, like Bruford, I too returned to the world of acoustic percussion. With a home studio and the space to practice, the beloved Gretsch returned with a vengeance. That being said, as an audio engineer and a musician playing both the Drummstick and later the Zendrum, I had been spoiled by the awesome sounds they generated, the reverb and delay at my fingertips, not unlike the days of the Simmons kits. This wasn't always possible at many of the venues I played at, and my desire for the best aural experience I could create gnawed at me whenever I encountered those challenging gigs. Bruford retired from live performances in 2009; I had the pleasure of seeing him and speaking to him before his show with Michael Borstlap in Bath in 2007, not knowing it would be one of his last. I loved his symmetrical drum set-up, his last unique drum configuration. Once again, I used an old chess adage, and that is to "understand a grandmaster, play his games and repertoire to get inside his head". And so it was with Bruford. No drummer has influenced me more. From the Roto-tom kit 1980s, the Simmons of the 1990s, to the symmetrical set-up of the 2000s. Every drum triggered extremely well, except for the kick drum. No matter how I adjusted it, the Ddrum Red Shot didn't seem to like the DW5000 bass drum pedal. One of the things I noted during my research was that many of the DIY drum trigger folks would mount the trigger inside the shell with the piezo placed on a bar, mounted on two L-Brackets, and a piece of foam covering the pick-up. Using an adjustable drum muffler from an old snare drum, one of my Pintech triggers and an L-Bracket, I drilled several holes to both mount the muffler, the L-Bracket and the 1/4" jack for the piezo. This allowed me to adjust the sensitivity of the Pintech, (attached by velcro to the muffler). I used some zip-ties to secure the 1/4" jack to the L-Bracket and positioned it so would mount flush to the shell of the bass drum. I also used one of the tom leg holders to attach the "Trick Floor Tom - Bass Drum Converter. The LP Claw system that came with it, also never felt right, so this was a real improvement moving the holder to the bottom of the drum. Not only did it work, it was even better than the Ddrum Red Shots. 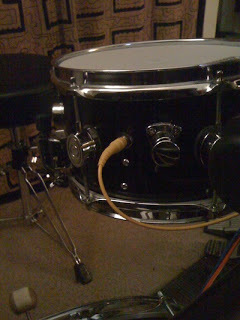 Nothing like having a piezo right under the fingertips/sticks, just like the Drummstick and Futureman's new "Drumitar". This got me thinking... Could I create a symmetrical "V-Drum" kit, made up of smaller acoustic drums with Pintech triggers, mesh heads and adjustable drum mufflers? The answer is yes of course! Ironically, I had most of the tools and the ingredients already. There was no way I was going to use the Gretsch kit; it's way too beautiful and sounds totally amazing as is. The Ddrum D2 14" x 16" floor tom had already been converted via the aforementioned method. I also had the snare drum as well, a 5" x 10" PDP "popcorn", however this time I removed the Red Shot trigger and added the Pintech. Once again, I drilled the holes and after a few adjustments, it worked as well as the Red Shot, with the added feature of plugging the 1/4" jack directly into the shell. All I needed now were more mufflers, L-Brackets and 4 more toms. It also dawned on me that I could duplicate the actual sizes of Gretsch toms and the symmetrical look and feel. Turns out that Ddrum makes an "Add-on Pack" for the D2 kit, featuring a 7" x 8" tom and a 12" x 14" floor tom. I got a great deal from "2kool4skool" on ebay and got a used 5 piece D2 from Guitar Center. The Ddrum add-on pack also comes with double tom stands, so serendipitously, my Ultimate Support cymbal arms will fit nicely with them, solving the cymbal placement issue for me. A trip to Sam Adato's Drum shop and I got all the lugs, clamps, and claws I needed. 4 more mesh heads and I would be good to go! The Ddrums soon arrived and the mesh heads from Guitar Center showed up around the same time. 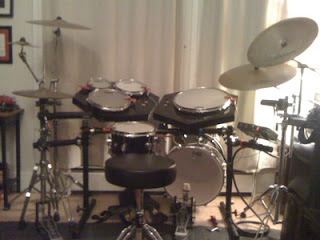 I decided however, to use the Ddrum Red Shot triggers on the Ddrums instead of the Pintechs. Less holes to drill, plus the Red Shots seemed to work great. In another experiment, I hooked up my Roland TD-7 to the triggers, but they didn't work anywhere near as well as the Alesis Trigger I/O, (with the exception of the "Reverb" kit). The Ddrum bass drum was huge, so I opted for the converted D2 floor tom/bass drum. Using the Roland FD-7 Hi-Hat trigger pedal, a Pintech "Dingbat" trigger bar and my Hosa snake, I was actually able to re-create a trigger set-up that would mirror the Zendrum. 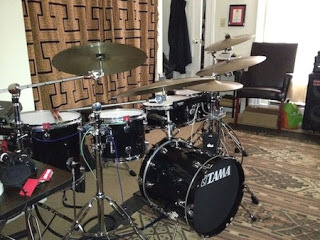 I now had an electronic-acoustic hybrid kit, virtually identical to the Gretsch kit; silent mesh heads that could be unleashed with my audio set-ups. The Alesis Trigger I/O was programmed use the "Dingbat" as my sample trigger device, and I selected the MIDI note numbers to correspond to each and every drum and "Triggerlicious" was born.